This brand new Kefalonian villa seduces with its architectural elegance and aesthetic appeal. 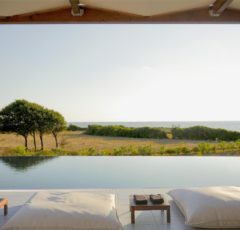 It divinely mounted over the Ionian Sea with huge outdoor spaces, including an infinity swimming pool and bamboo pergola with its own outdoor BBQ.The beautiful natural landscape is perfecting this most luxurious Mediterranean ambience. Villa Madelaine’s strategic location, at the outskirts of Klismata village, combines the convenience of being very close to Argostoli and the airport with easy access to small secluded beaches and coves. Also, in a few minutes driving distance there are plenty of friendly traditional taverna and charming bars by the beach. The elegant decoration complements the Mediterranean architectural style of villa Madelaine with carefully chosen furniture that generously gives a distinctive personality. Terracotta tiles, wooden ceilings and handpicked furniture create a warm and homey ambience providing for an overall comfortable accommodation. The outdoor space is equipped with sunbeds and several sitting and lounge areas, offering unique relaxation enhanced by fabulous sea views over the Ionian Sea up to the neightboring island of Zakynthos (Zante). The fabulous and easy to use outdoor BBQ, is ready to offer unique Greek summer dinners but in case you don’t feel like to cooking yourself, you can always engage a private chef.